Ever wondered what it’s like to go straight from school into work? IT Apprentice Ryan tells us all about his experience, how he managed the transition and what his job has taught him. 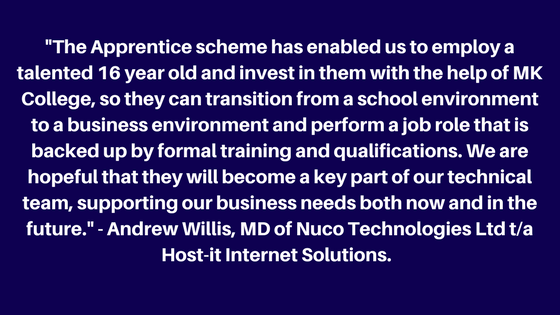 “I first applied for a job with Nuco Technologies in May 2016. After a quick response from the company they confirmed their interest and an interview/tour took place afterwards, following on with a two week trial period in July. After this trial I was happy with what my role was going to be, and they were happy with keeping me on. We decided to do an apprenticeship with MK College since this would let me develop my current skills as well as progress further, learning everything that relates to my job and the industry. I have always had an interest in IT from a very young age, I started by taking apart various computers, learning about each component, what they were for and how they worked. I was also playing around with Linux, which helped me pe into the command line and get more advanced knowledge on how the operating system works. Most of my knowledge has come from fixing problems with my own computers. Instead of just taking them to a shop to get repaired, I would instead look into the issue and try to resolve it myself, this alone got me understanding how everything works, while also giving me knowledge of common problems people have with their computers. It wasn’t long before people were asking me to look into their technical problems, whether it was physically fixing someones laptop or remotely connecting to their machine through RDP or SSH to fix the problem.